· 1 tsp. Turmeric pwd. Wash the chicken pieces, apply salt & keep aside. On a tawa or pan, toast the kashmiri chillies, cumin, coriander seeds, mustard, nutmeg, pepper, cloves, cinnamon, khuskhus, til, methi seeds, sauf, elaichi, star anise, fresh or dry grated coconut, coconut pieces, 2 of the onions in a little oil each separately. Toast well but do not burn. Keep the toasted coconut pieces aside separately till required. Grind the remaining toasted spices alongwith ginger, garlic, green chillies & turmeric to a fine paste with water. Apply half of the masala paste to the chicken pieces, mix well & let it marinate for about 30 mins. Take a large pot or pan & heat oil on med. heat. Fry one chopped onion till light golden. Add the marinated chicken & saute well for about 5 mins. 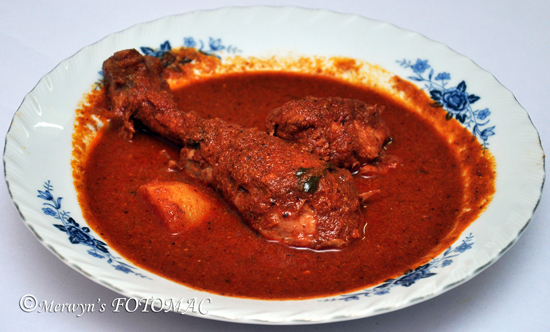 Add the remaining masala paste, saute & fry the chicken along with the masala well. Add sufficient water to the chicken to form a gravy. Rinse the halved potatoes in water & add to the chicken gravy. Let the chicken come to a boil & then reduce heat & let it cook covered for about 5 mins. Now add the tamarind pulp & tomato puree & mix well. Let it simmer till the chicken & potatoes are cooked till tender & gravy is sufficiently thick. Make sure it is not too thick. Garnish with reserved coconut pieces & coriander leaves. Let the gravy settle for a few minutes for the flavours to meld. Serve hot with steamed rice, bread or sannas. * Chicken Xacuti tastes better if eaten the next day. * Do not over cook the chicken. * Make sure you toast the coconut to a golden brown. * Well toasted spices give out a fragrant aroma. * You can exclude potatoes if you wish but I prefer with potatoes. * Use only Kashmiri Chillies. * Try & use fresh tamarind pulp. * Marinating chicken overnight brings out the flavours better. Excellent site, lot of popular recipes, wooderful. Thanks and Bon Apetit.